Was it practiced by German soldiers or did it come from the same place the practices the "tactical AK reload" that demands smacking the magazine release with another magazine? Well HK in the MP5 manual says to slap the charging handle. 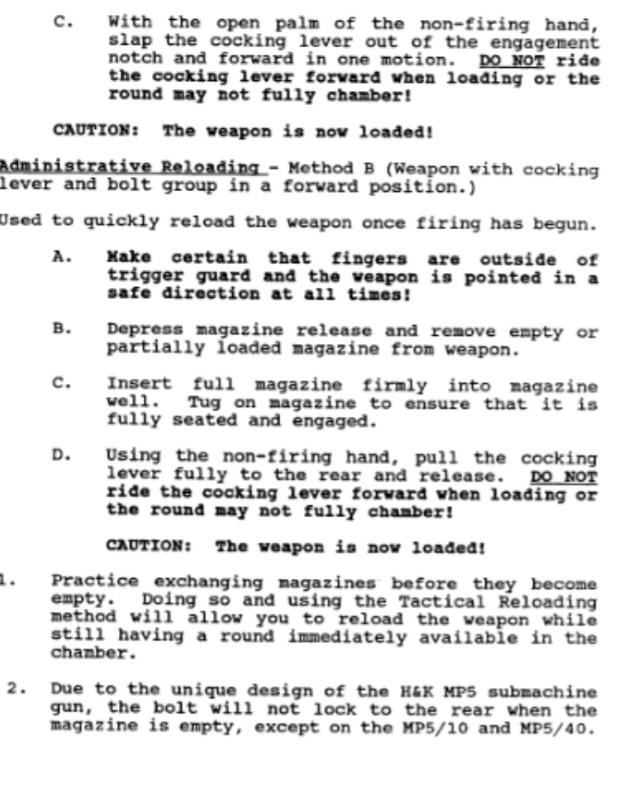 I found the section of the MP5 Manual that instructs the HK slap. Last edited by Klaus Von Richter; September 28, 2018 at 10:41. The G3 manual says "release the cocking lever" and shows a left palm and a forward arrow. But it is a lot stiffer slapping a G3 than an MP5. The 41 manual says "Permit the cocking lever to snap forward from rearmost position" and shows an open right palm coming across the top or the rifle. The only problem I have with slapping it is the inevitable wear it puts on the charge handle guide tube. I can't say I've ever seen one so worn as to not lock open, so perhaps my "concern" is without merit. But then GIs don't worry about collector value. But what about the OPs question about the mag release ? Other than finish wear I couldn’t imagine the HK slap wearing out a charging handle or a cocking tube recess. All my HK clones I built to be used, so I slap them like they owe me money. If you were dealing with an original MP5,91,93 etc, I can understand why some would be easier on them. As for a GI, I’d imagine knowing your rifle is properly chambered is more important than finish wear on the charging handle and or cocking tube. Look at all those Cetme kits with bent cocking tubes. The OP was asking whether slapping the cocking handle is as stupid and retarded as using a magazine to strike the mag catch. You will also note, that the manual specifies a less violent method of chambering (Pull and release) for administrative purposes. I believe that outlining an "administrative" (range) method and a non-administrative method (combat), suggests that there is a long-term detrimental effect of slapping. Otherwise there would only be one method. The point of both, as with any charging handle, is to let the action do the work. Do not "ride" the charging handle forward, as this can result in incomplete chambering. Last edited by gunplumber; September 28, 2018 at 11:11. I cringe whenever I see someone slap the charging handle. I just don’t see the point. I know everyone thinks it looks cool, but in a real world scenario is it really useful? Why would you ever need to lock the bolt back between mag changes? The longer the action is open, the more chance of dirt and debris entering it causing a malfunction. Also, it seems like doing the slap just adds to the recharging process. Remove empty mag, insert loaded mag, pull back charging handle,....simple. I don’t think that there’s anything wrong with doing the HK slap. It’s just not for me. To slap, or not to slap, that is the question. Why would you ever need to lock the bolt back between mag changes? I see you've never tried to insert and lock a fully loaded mag into an HK type on a closed bolt. Give it a shot. Then try it under stress. Come back and post your results. I've seen HK instructors promote the slap. Big whoop. I've seen well used HK types with the locking notch worn almost completely flat with a big burr of smooshed material sticking up in front of the damage. I've slapped a few but more normal protocol is to pull the charging handle back, rotate down, and let it slip from my grasp. What GP refers to as "administrative purposes". Personally I feel the slap is borderline abuse. Sue me. I didn’t mean to imply that my way was the only way, or even the best way, for everyone. I simply meant that in 25yrs of using that technique I’ve never had a problem seating a fully loaded mag in an HK weapon. So...recent range experience with a HK93 clone. Was unable to insert a loaded magazine while the cocking handle/bolt was forward...magazine loaded as normal once I locked the bolt back, and the rifle operated as advertised. I learned something that trip, haven't taken the HK type rifle family members out in a very long time (little rusty). Didn't slap it forward/down with any force, more like "popped" it. Good times! I can insert loaded mags into my PTR-91 with no problem, but the slap is fun on occasion. I don't shoot it enough to worry about it, though. I can insert loaded mags into my PTR-91 with no problem, but the slap is fun on occasion. If you don't care about wear and tear on an HK gun like most LEO or Military folks do, slap away. I never saw the sense in it. Some of the HK clones I have are a bit to spendy to beat on. Don't want to break a cocking handle or cause a problem with the metal cocking tube...to lazy to fix it. You've got the technique down. the Bundeswehr firearms instructors always told us to slap the cocking handle due to the need for the bolt to go fully into battery, it is what I was taught in a military that used the HK G3, it is in the manual of arms. I do not shoot my HK91/G3's very often but when do pull back on charging handle, let it fly and shoot. Never had one of mine fail to fully go into battery but as purchased mostly for collector/investment reasons they generally don't get run hard while being abused. Keep them clean, oiled and mostly vault queens for now but am itching to put a Franklin Binary Trigger Pack in one and if do so it might get treated a lot less gently plus used a lot more with surplus ammo. If that day comes and fails to go fully into battery a couple times may start slapping it around gently. Like a woman, sometimes need to get their attention but if leave any bruises its counterproductive. (Just joking folks, be a good way to wake up with a fork buried to the handle through the eye socket at my house) If the rifle would not chamber a round dropping the bolt freely would likely start looking at possible replacement of springs or other issues with the rifle. Laying in a mud hole getting shot at and will beat on it like a rented mule if necessary to make sure always fired on a freshly charged magazine.